LG's update to its flagship phone keeps the design mostly the same while making strides where it really counts: under the hood. This year's phone is slim, powerful, and loud thanks to its metal-and-glass design, Snapdragon 845 processor and AI Camera, and massively loud speaker. Here are our first impressions of the LG G7 ThinQ. 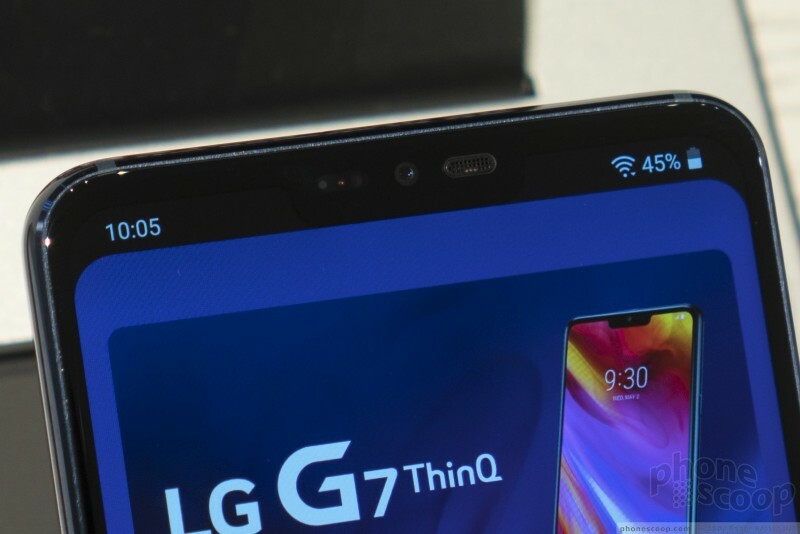 LG hopes the G7 ThinQ will appeal to would-be iPhone and Galaxy buyers who are perhaps looking for something a little different. It borrows the best features from LG's own G6 and V30 in order to create a more well-rounded phone that still looks and feels good to use. If you care to know, "ThinQ" is pronounced "thin-queue" (yes, two syllables), not "think" as one might have hoped. It's a terrible brand name that LG is applying to all is AI-capable devices, which includes TVs, microwaves, and refrigerators. 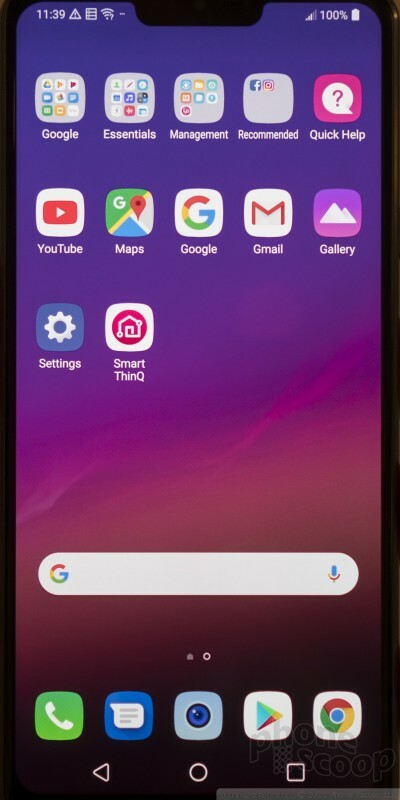 The "LG G7 ThinQ" is a clumsy name at best, so from here on out we'll refer to the phone as simply the G7. 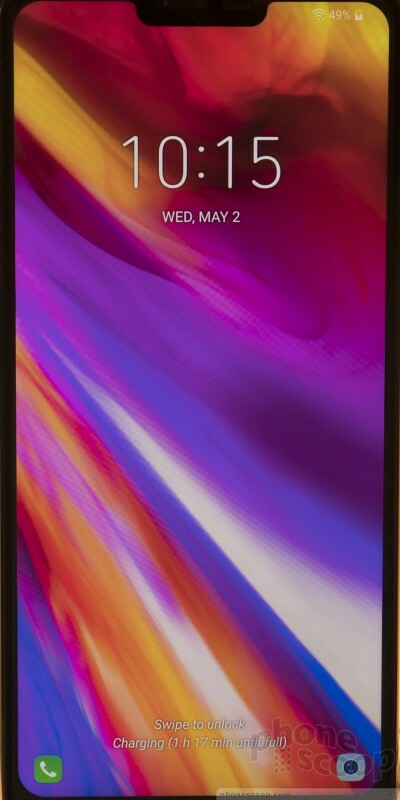 The G7 has the tall and narrow shape of the G6 with the rounded, thin profile of the V30. It's an attractive piece of hardware, if not terribly unique. The smooth metal frame wraps around the middle and it is sandwiched between two sculpted pieces of Gorilla Glass 5. The G6 was a bit thicker along the sidewalls and the V30 was wider from side-to-side. The G7 falls nicely in the middle. I can't say it stands out visually, thanks to the huge number of metal-and-glass phones in the market these days. It is conservative and refrained. Even so, there's nothing to dislike, perhaps other than the fragile nature of glass. The experience of holding and using the G7 is much the same as any other phone made of these materials. I found its size and shape to be comfortable. 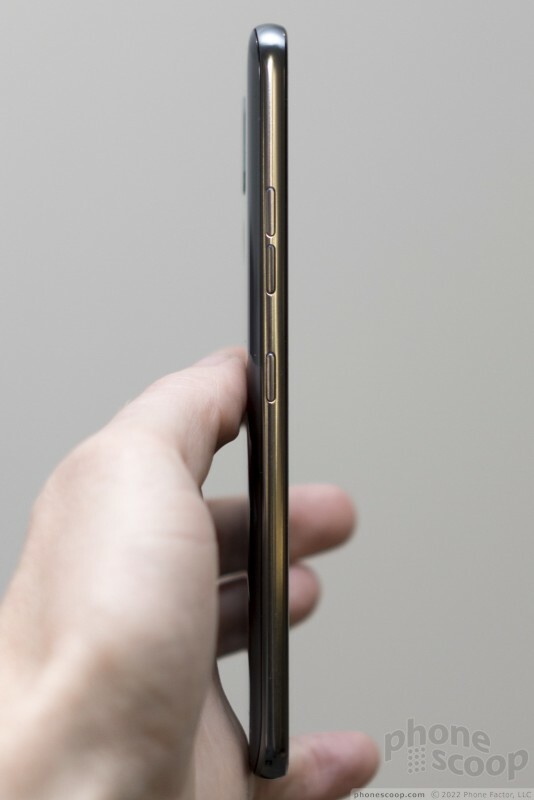 It's 7.9mm thick, which is very slim. The phone's polished exterior makes it a bit slippery, and the profile ensures that it glides into pockets and other places effortlessly. The quality is not in question and the assembly is as fine as any other phone in this class. 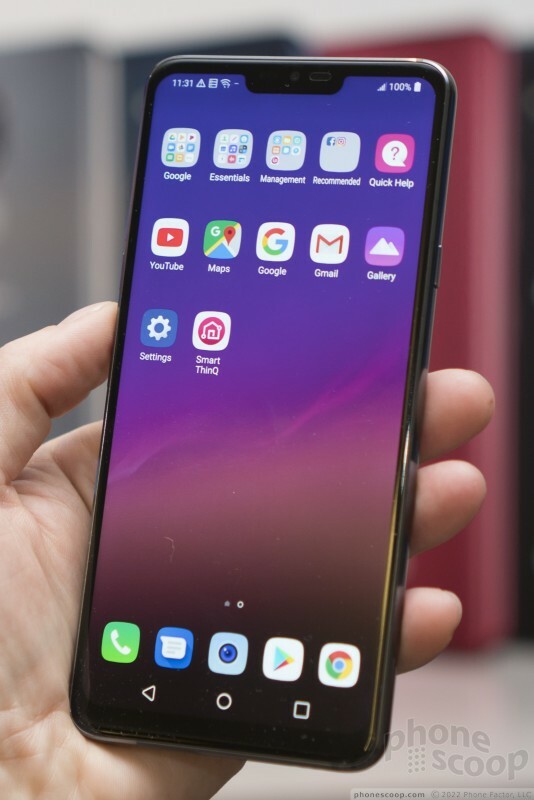 The phone's face is all glass and nearly all display. 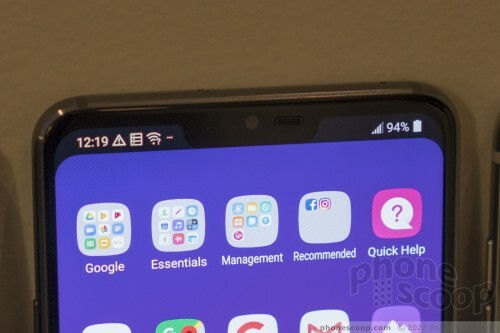 LG worked hard to put as many pixels as possible on the front of the phone. The screen measures 6.1 inches across the diagonal, and that includes the notched area. LG extended the aspect ratio from 18:9 on the G6 and V30 to something a bit taller on the G7. 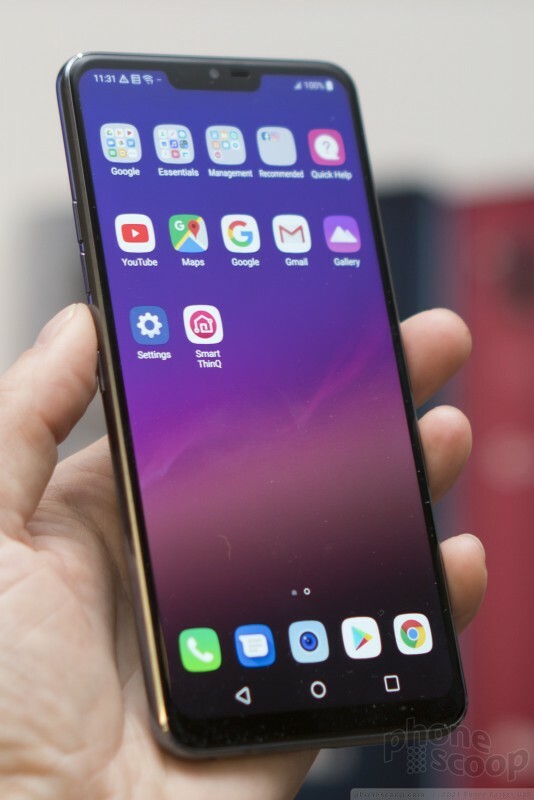 The extra height accommodates the pixels needed to form the info bar on either side of the notch. The resolution measures 3,120 by 1,440 pixels. 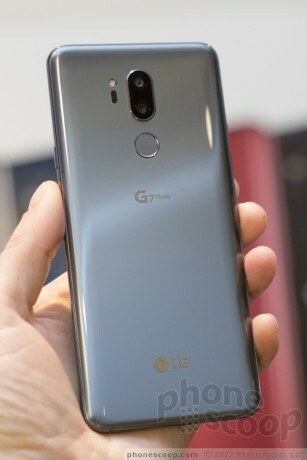 The chin is 50% smaller than that of the G6. Lemme tell ya, the G7 is as close to all-screen as it gets. There are no buttons, no controls, no fingerprint readers on the face. It's solid screen. About that screen. LG claims it is using its a Super Bright Display LCD, which pumps out 1000 nits of brightness. The Super Bright Display tech relies on the standard RGB pixels for color, but adds white pixels for added luminescence. The phone then uses its sensors and the processor to intelligently change brightness on the fly to match the surrounding light. LG says the huge brightness factor makes the G7 great to use outdoors, but I disagree. The pre-production units we evaluated were difficult to use outside under cloudy skies. 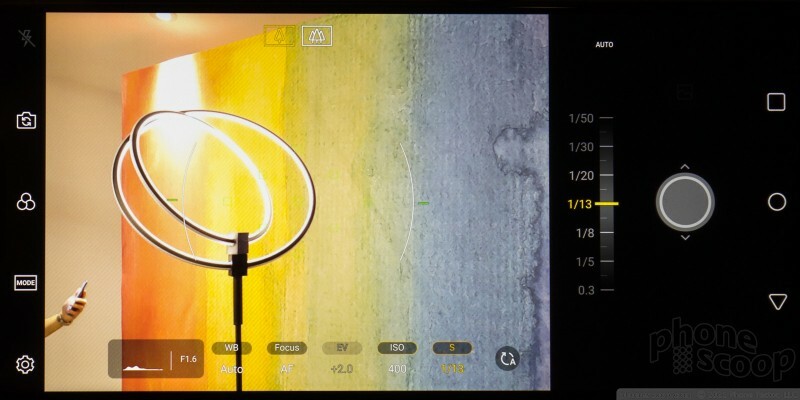 In fact, with the brightness dialed all the way up the G7's screen didn't hold a nit to the Pixel 2 XL or iPhone X. Hopefully this is an issue with the pre-production devices we saw and not the final products. Other than the brightness, the LCD is amazingly rich and sharp. It supports HDR+ playback for the ultimate cinema-like experience on your phone. You can "erase" the notch if it bothers you with some software tricks, but it's not perfect. Because the screen is an LCD (v. OLED), the ears never fully disappear when in the hidden mode. LCD's can't produce 100% black. 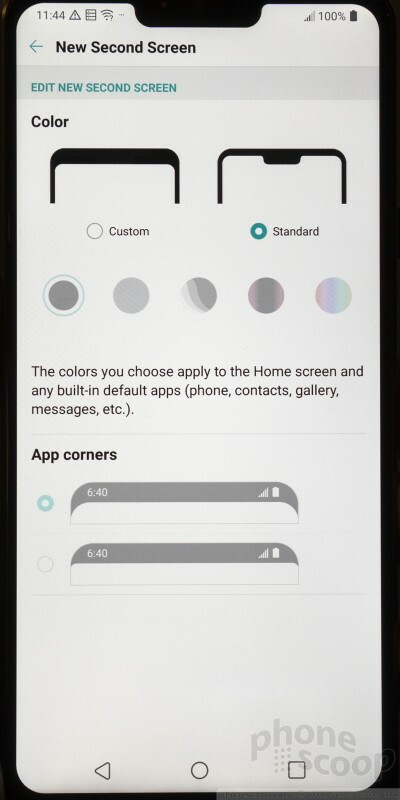 It's neat that you can customize the notch ear backgrounds separate from the wallpaper, and even control the rounding of the virtual screen corners. LG has changed up its strategy with respect to the G7's buttons. First, and most importantly, the G7 adds a screen lock button to the right side of the phone. Both the G6 and V30 require users to press the fingerprint sensor on the back to wake their phones. This is sometimes awkward. 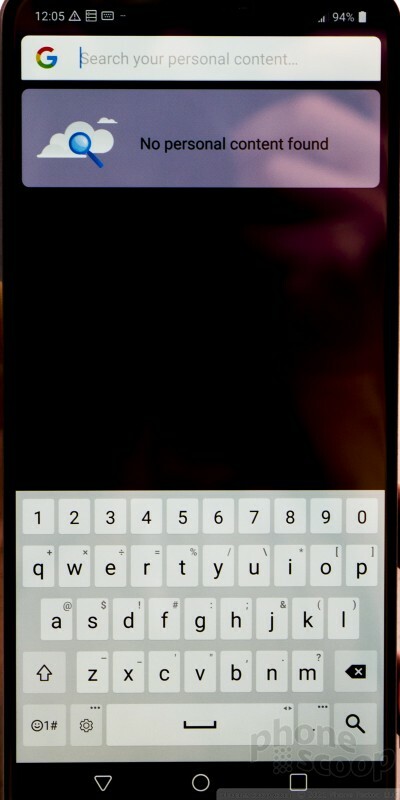 Moving the screen unlock function to a dedicated button on the right edge makes me happy. LG says it made this change based on user feedback. It's a good change. The button is located high on the right edge, but it has a nice profile and works perfectly. 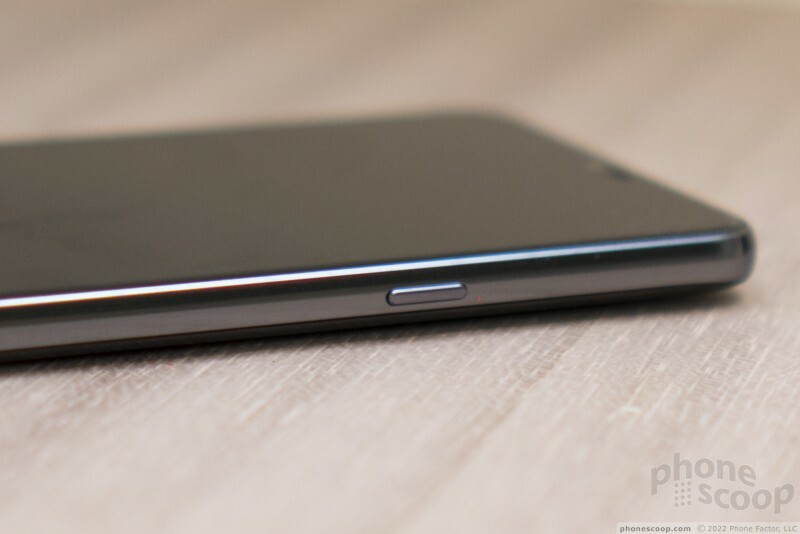 The left side of the phone holds the individual volume buttons as well as a dedicated button for the Google Assistant. Physically, these keys all work perfectly. Some will surely groan about the Google Assistant key. Samsung made a similar move with its latest Galaxy devices, which have a hardware button for calling up its own Bixby user assistant. At least LG is going with Google Assistant and not its own software. 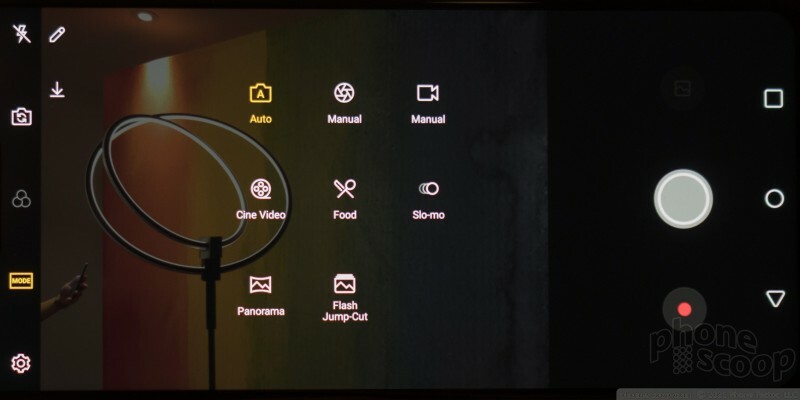 The good news is that LG has developed some custom commands, such as "Take a low-light photo" and such. That's helpful. 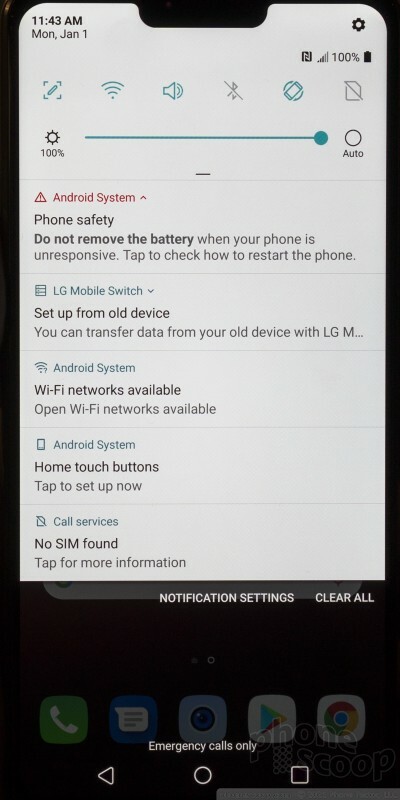 Even so, LG says the button cannot be disabled and cannot be remapped to do something else — at least not for the time being. Along with the dedicated button, LG says it has improved far-field voice recognition for the Google Assistant. 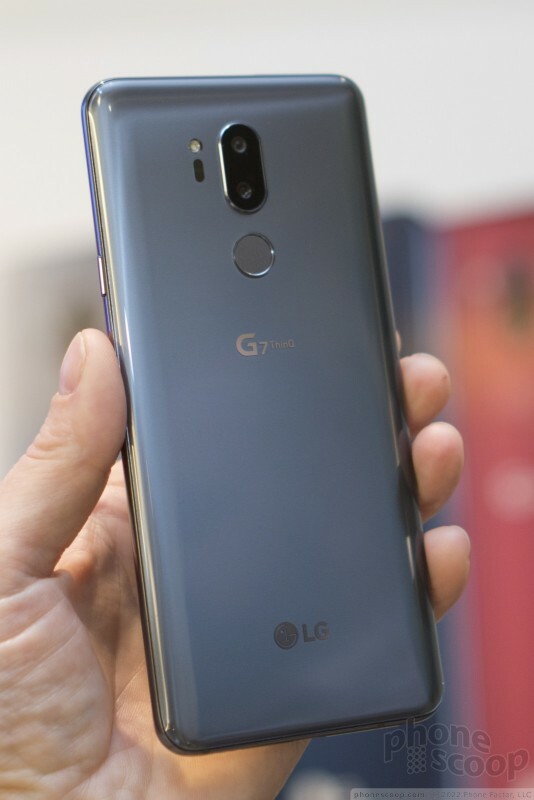 It is using the G7's two mics and noise cancellation in order to boost its ability to hear the "Hey Google" hotword for waking the Google Assistant. LG says the G7 performs 35% better than other phones at sussing out commands from as far away as 6.6 feet even in really loud environments. This isn't something we were able to assess in the event space. The G7's bottom edge is pretty typical for a modern smartphone. The USB-C port is in the middle and it is flanked by a series of holes for the speakerphone and the 3.5mm headphone jack. 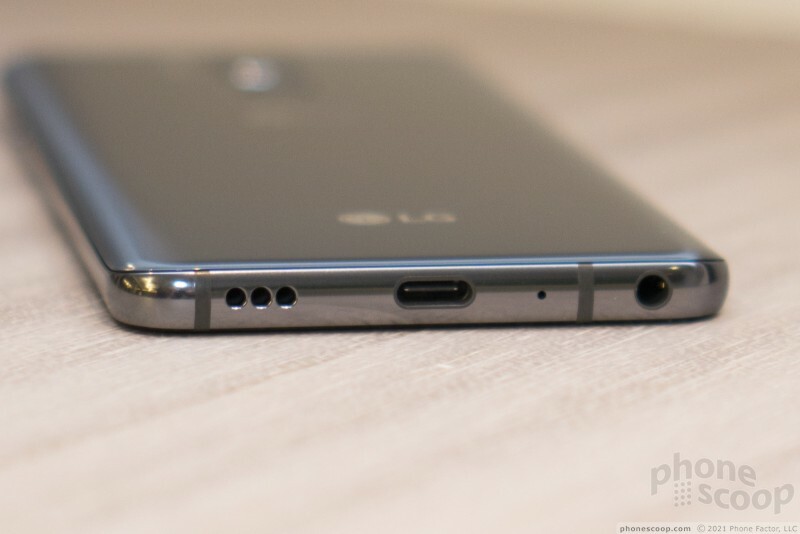 I'm glad LG is sticking with the headphone jack. This sets it apart from devices from Apple and Huawei. Moreover, the jack has its own quad-DAC for super high-quality sound via wired headphones (or when plugged into stereo equipment). LG is calling the speaker a Boombox, which it claims is 39% louder than any other phone. It is taking advantage of the sealed interior to create a resonance chamber to help amplify sound. The result is an incredibly loud speaker that delivers a huge amount of sound. The phone easily fills a small room with rich music. The music is amazingly well balanced. We sampled R&B, rock, pop, and jazz and it all sounded good. The G7 is a phone for audiophiles. On the phone's top surface you'll find the SIM / memory card tray. It requires a tool. 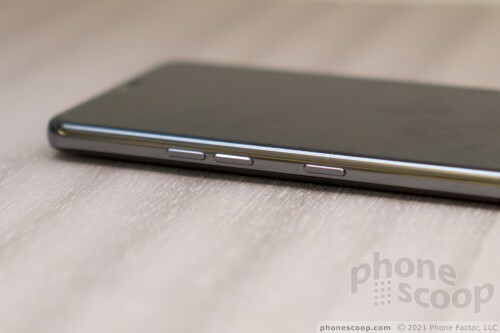 LG didn't do much to dress up the rear panel of the phone. It's a large piece of glass with slight curves near the outer edges. I dig how smooth it is. 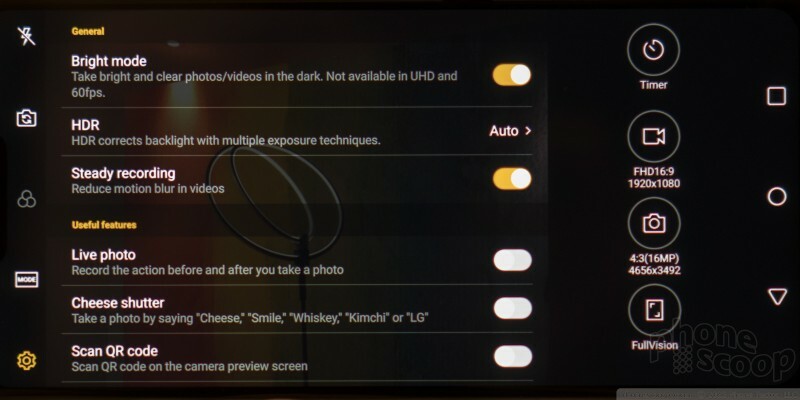 LG did change up the camera and button configuration a bit. On the G6 and V30, the dual camera arrays are arranged horizontally side-by-side. On the G7, the dual camera mobile is arranged vertically. The camera module has a minimal profile, which I appreciate. The fingerprint reader is right where I like it to be. The reader is now just a reader; it is no longer also a button as it on the G6 and V30. 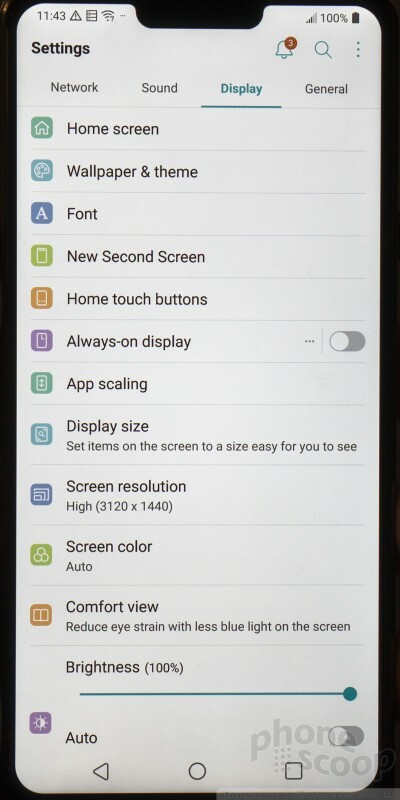 LG said the reader does not support advanced features such as scrolling. Other specs worth calling out: The phone has a 3,000mAh battery, which seems a bit small to me considering the competition. Thankfully it supports rapid charging, and rapid wireless charging. I'm glad to report that the phone ships with Bluetooth 5.0, dual-band WiFi, Cat 18 LTE, and NFC for mobile payments. Those are all pretty much table stakes for a flagship device these days. The phone is IP68 rated for protection against accidental baths. It can handle up to 30 minutes in 1.5 meters of water. This all-glass phone is not rugged, not at all. Drop it and it will probably crack. 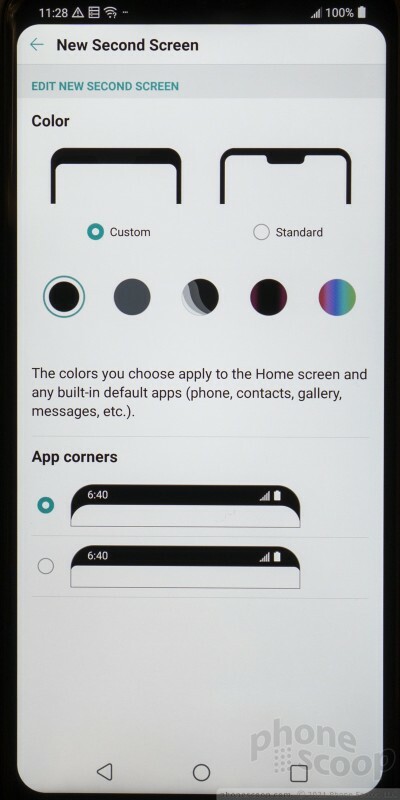 The lock screen supports custom shortcuts and notifications, and the home screen comes either with or without an app drawer — you can choose. 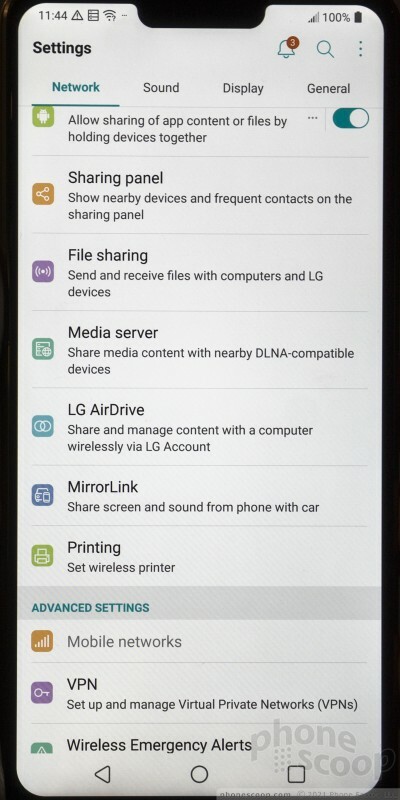 LG's toolset offers knock on and knock code for waking the display, adjustable grid sizes for the home screen panels, and configurable action buttons at the bottom of the screen. These are all old hat. 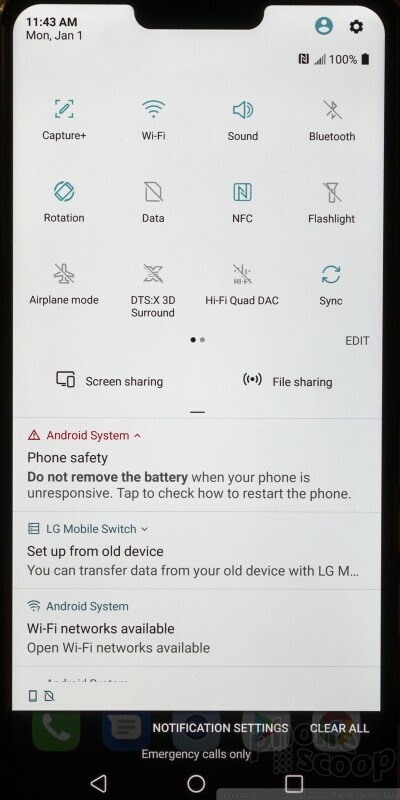 Like the V30, the G7 offers an optional floating information bar. 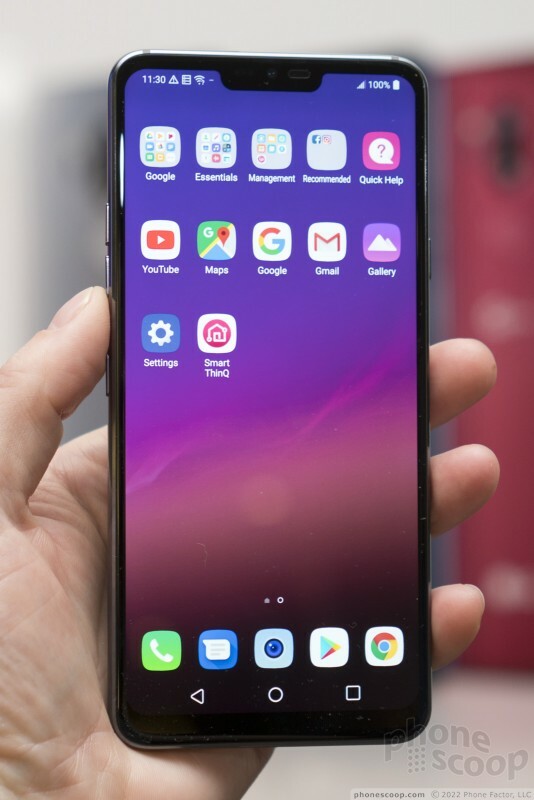 This feature lets you quickly access and control certain feature of the phone, such as the media player and messaging apps, from a floating dock on the home screen panels. I am not a fan of such tools, but it is there for people who do appreciate the option. The camera offers the most significant update as far as software is concerned. On the hardware front, LG has changed things up just a little bit. 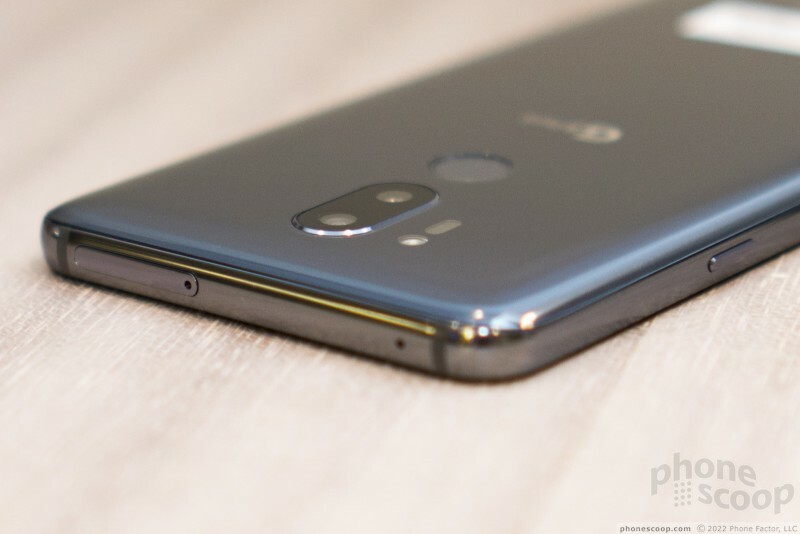 The phone features two 16-megapixel cameras on the back: a standard-view lens (71 degrees) at f/1.6 and a wide-angle lens (107 degrees) at f/1.9. 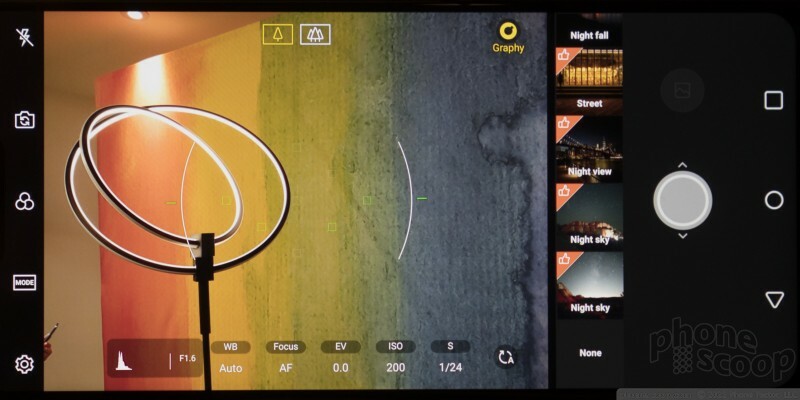 LG says it reduced the angle of the wide lens from 120 degrees to eliminate optical distortion. This means you'll be able to fit a bit less into the frame when compared to the G6 and V30. *sniff* The front camera has an 8-megapixel sensor at f/1.9. 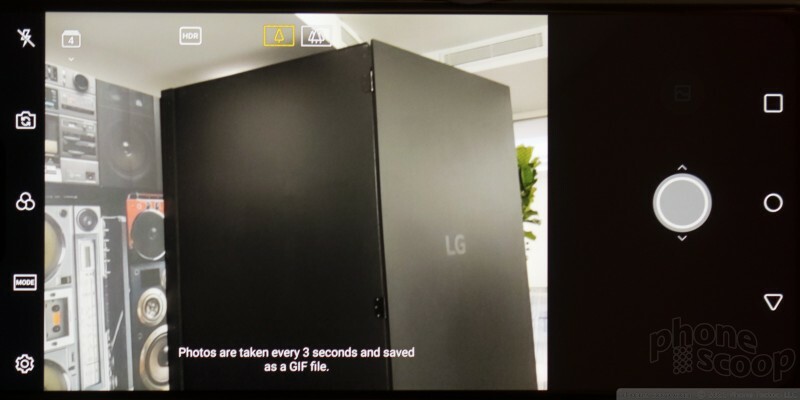 LG is taking advantage of machine learning and the Snapdragon 845's image signal processor to help the G7 recognize 18 different scenes, such as flowers, pets, the beach, and more. This AI Cam then adjusts the parameters to capture the best shot based on the scene. 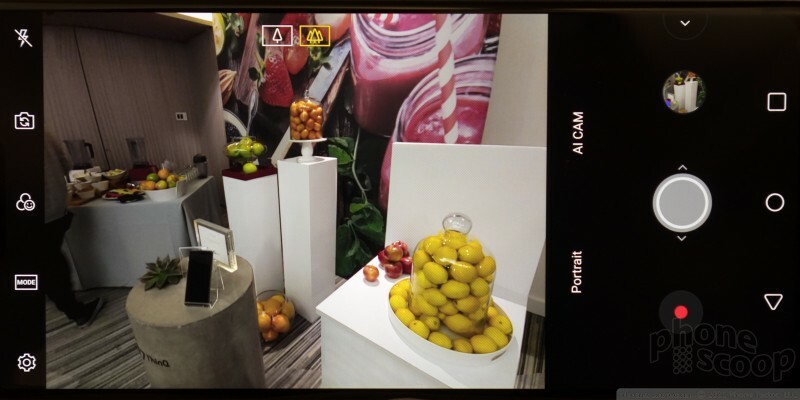 We tested it with some flowers, fruit, and other objects and found it generally picked the right scene. It's not perfect, and it's not very quick, but it does adjust eventually. As other modern phones do, the G7 supports portrait shooting. When using the rear camera the G7 will automatically adjust to portrait mode when it senses you are photographing a person. 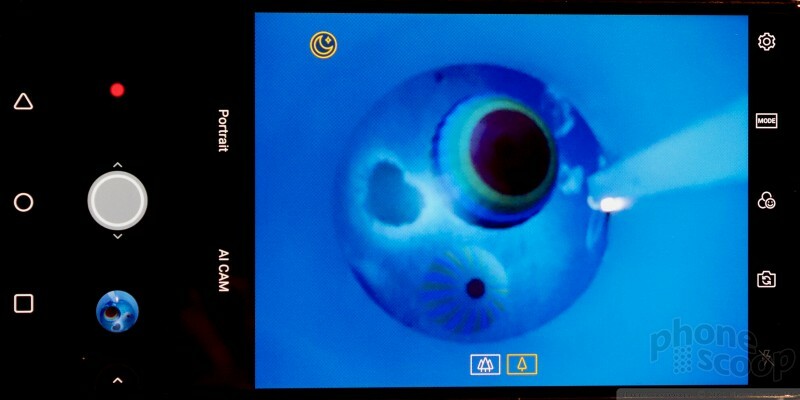 The phone puts both the rear-mounted cameras to work in order to create blurred effects. The samples we took on-site looked good. 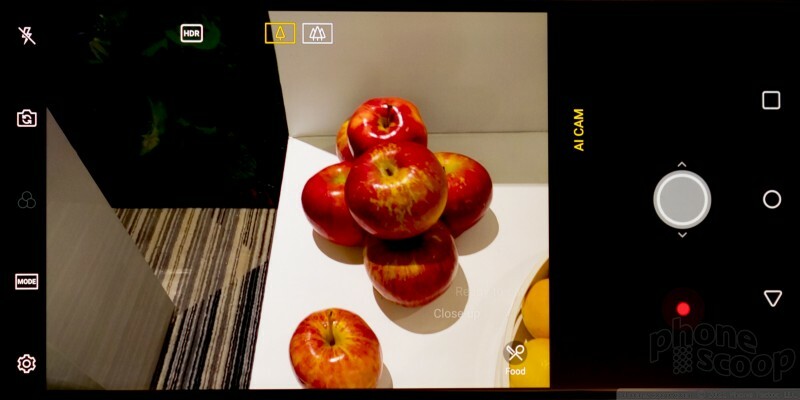 The front camera offers portrait shooting, too, but relies on software to create the effect. LG says it has made strikes in low light camera performance. The G7 uses pixel binning, which combines four pixels into superpixels in order to quadruple light sensitivity. The Bright Mode will turn on automatically when it senses the lighting is at 2 Lux or less, and will recommend that you turn Bright Mode on when it senses light is between 3 and 10 Lux. LG says it captures far brighter photos in the dark than the Samsung Galaxy S8 (yes, last year's S8). The samples we saw looked decent. The G7 can capture video up to 4K (Ultra HD), but capturing in HDR+ is limited to 1080p (full HD). The fact that the G7 can capture and playback HDR+ content — which is much more contrast-y and rich than normal video — is awesome. Sadly, the G7 doesn't offer neat tricks like super slow-motion. The G7 is set to go on sale soon. 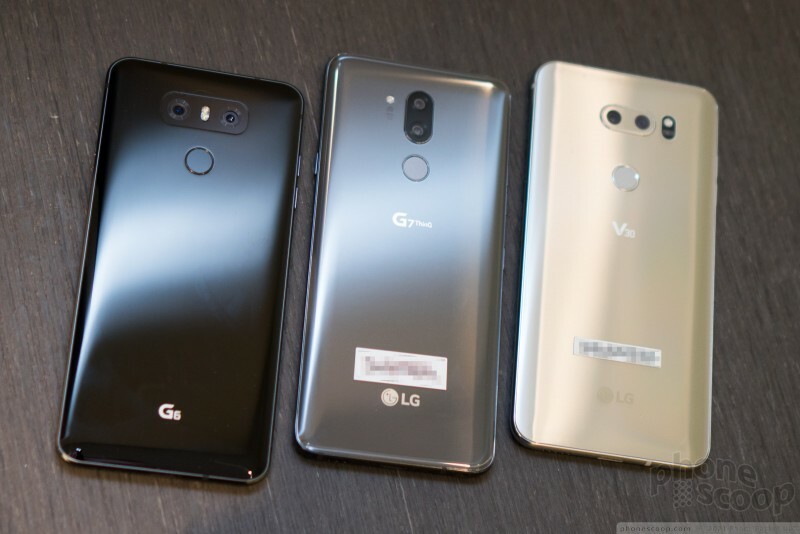 LG didn't announce pricing and carrier availability, but it's safe to assume that AT&T, Sprint, T-Mobile, and Verizon Wireless will be quick to let us know the details. At first blush, it's easy to say the G7 is LG's best-ever effort. Even so, it's not all that different from the G6 or V30. LG took the most appealing features of those devices and merged them into a single, powerful phone. As long as the pricing is good, the G7 should be a worthy competitor to Apple and Samsung's best. 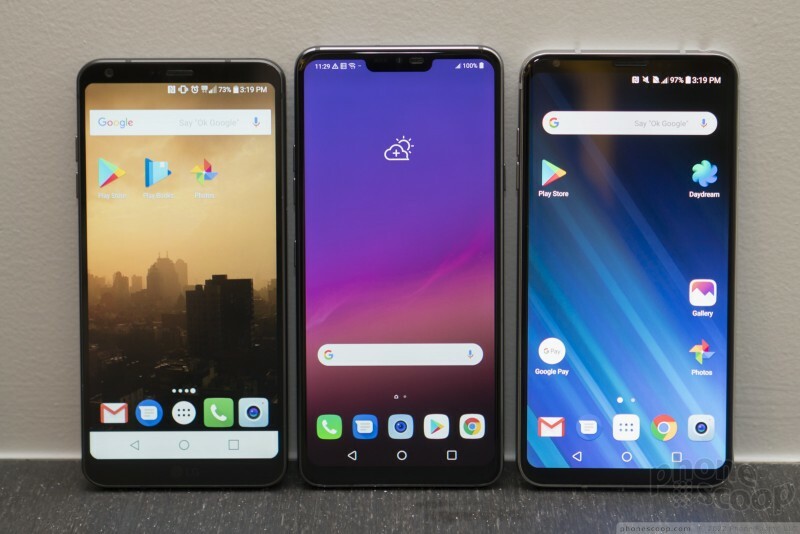 LG recently rolled out two new entries in its G7 range. The G7 Fit and G7 One have the same basic appearance as the flagship G7, but aren't quite the same when it comes to the in-hand experience. 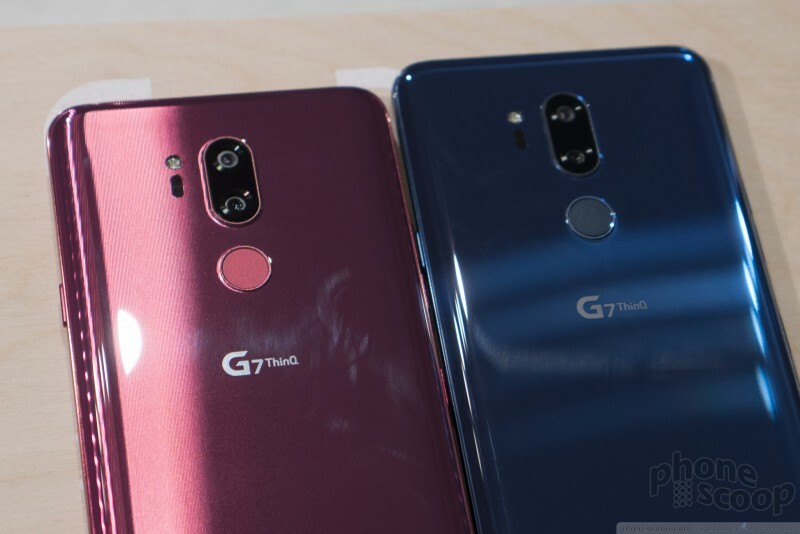 T-Mobile today revealed launch plans for the LG G7 ThinQ. Pre-sales for the phone begin Friday, May 25, with general retail availability starting June 1. LG today announced the G7 ThinQ, its 2018 flagship phone, at an event in New York. The phone merges features of last year's G6 and V30 to create a more powerful phone that's easier to use. 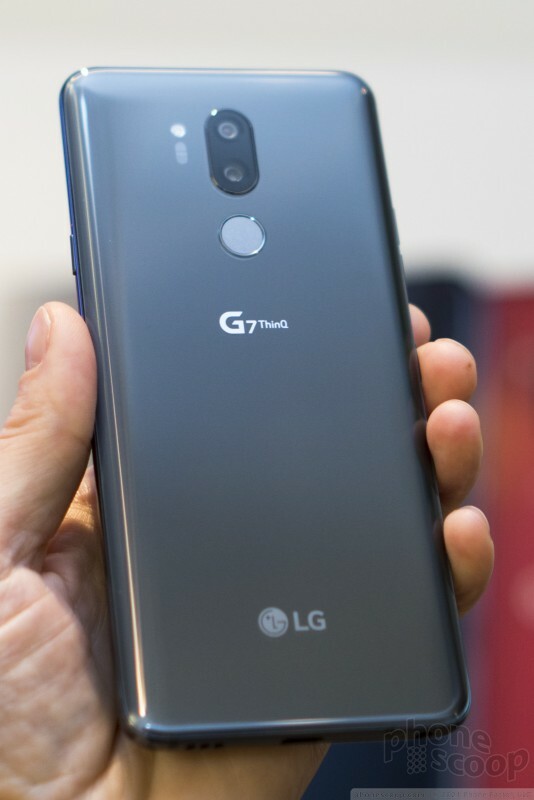 LG today announced the G7 One and G7 Fit, phones that share the basic design of the G7 ThinQ but dial back the specs in order to make them less expensive. 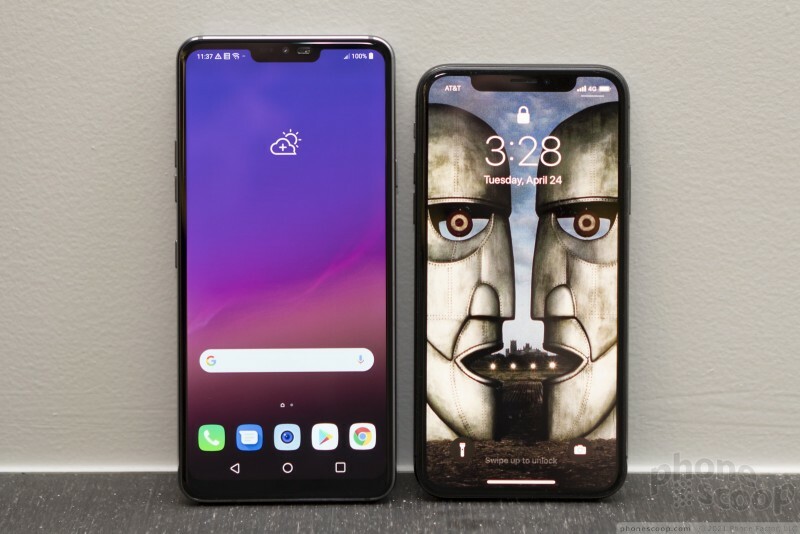 Shared features between the two include 6.1-inch quad HD+ LCD displays (3,120 by 1,440 pixels), 3,000mAh batteries with QuickCharge 3.0, LTE 4G, WiFi, NFC, and USB-C connectors.